GT23M-TM transducer is perfect for coastal and offshore fishermen who want CHIRP traditional sonar and CHIRP ClearVü scanning sonar. GT23M-TM transducer is perfect for coastal and offshore fishermen who want CHIRP traditional sonar and CHIRP ClearVü scanning sonar. This transom mount transducer consistently displays clear and crisp fish arches with superior target separation as well as clear definition of structure below the boat. 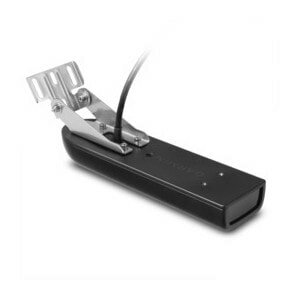 The 8-pin transducer features mid-band CHIRP traditional sonar (80-160 kHz) and has a power rating of 600 W. The CHIRP ClearVü (260/455 kHz) element has a power rating of 500 W.
Maximum depth: Traditional: 1,800 ft.; ClearVü: 1,000 ft.